PLEASE NOTE: This service is only available to first team management or representatives. Please use the form below to submit your request to the PFSA. Once we have received all your details the PFSA will be in touch to confirm the requirements. Please read through the below carefully which sheds light on the process and expectations of the scheme. Once you have completed the below form, it will take around 1-3 weeks in order to process the request for access to certified football scouts and analysts. In this time the PFSA will set up your clubs specific online portal (where scouting reports will be published), allocate scouts and ensure all fixtures are covered. Once this is complete and football scouts are in place, all reports will be uploaded online for you to download. 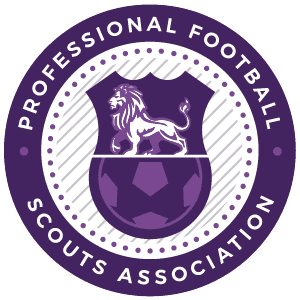 Take a look at the process dropdown below which will give you a good understanding of the PFSA Scouting Network process. ​Once your club has registered, we will take a moment to get in touch and go over any specific requirements you might have for the season. Whether its opposition reports or general football scouting. This way we can set expectations with the football scouts. We will also create your unique portal where you can review all your scouting and analysis reports for the season. ​The team at the PFSA will then process all your fixtures and opposition for the season. This is usually an excel document with club contacts, ground information and directions etc. The PFSA will then contact our network and allocate either a football scout or analyst who lives within a reasonable distance of the allocated fixtures. Once the football scout or football analyst are allocated we can then begin to generate scouting reports! Once we have allocated football scouts to your club we will schedule fixtures on a weekly basis and provide requested reports whether individual or opposition analysis.